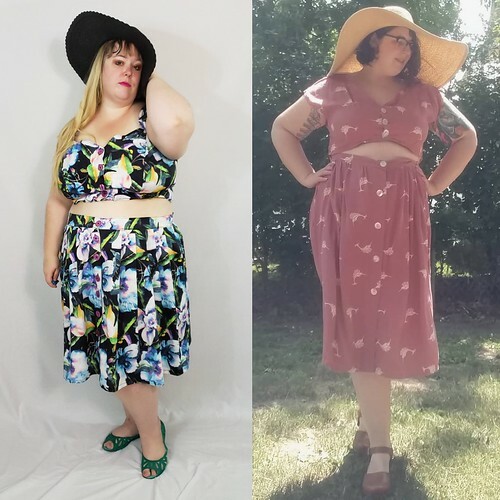 I originally posted on the Sewcialists blog about this project, but I definitely wanted to also post here, because Hello my blog needs this post too! I also have a bunch more pictures to share. 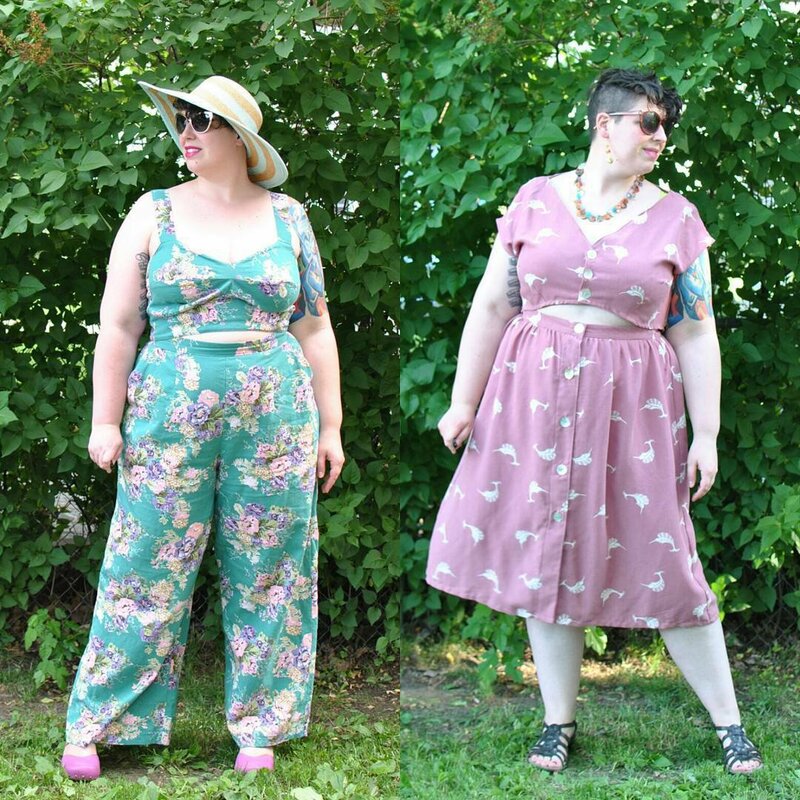 I chose Shannon from Rare Device for my Sew Style Hero for many many reasons. I love her style. She has a knack for great colour and fabric choices. The things she wears always look great on her and embrace trends like crop tops, wide legged pants, etc. She plays with gender in her style. Something I used to do a lot, but haven’t done in recent years since I started sewing for myself. It is something I want to do again (I even have a button up shirt cut out!) with a focus on making things that are comfortable for me to wear given my physical disabilities. She started Sew Queer and that prompted me to start Chronically Sewn to help highlight sewists with physical and mental chronic illnesses. Speaking of style, Shannon is known for her crop top and flowing skirt or pant sets, either matching or mismatching. She is actually just finishing up another set using a monstera leaf print that makes me super envious! 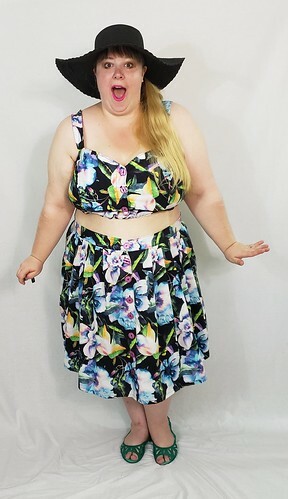 I looooove the look, but I had never tried a crop top before in my life. What better time to overcome a fear of releasing the mid-drift? 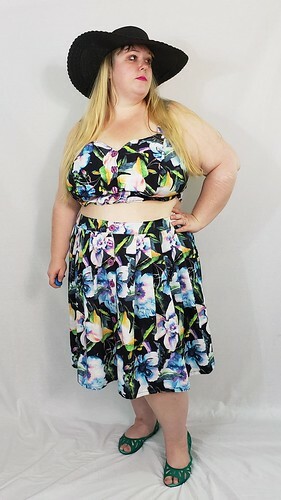 I went through my stash looking for a fabric that would be perfect for the set and had just enough of a lovely soft cotton tropical flower print. For the crop top, I chose the bodice from the Simplicity 8096 dress view A. To the Simplicity bodice, I added a band at the bottom and elastic through the band. I also added a button band at centre front and cut the back on the fold eliminating the zipper back there. The entire top unbuttons from the front and is incredibly easy for me to get on and off with my physical constraints. It’s incredibly comfortable. I made the skirt without a pattern. It’s just a simple pleated skirt with pockets and a button band. The look above on the far right of Shannon is the look that inspired mine. The skirt is cut a bit shorter due to fabric constraints. I am also much shorter than Shannon so it actually looks the same length on me! A big floppy sun hat completes the inspiration look! And I actually feel incredible in this look! Crop tops are some kind of wonderful. I love the purple buttons I got locally for both the crop top and skirt. They look great with the floral print. The skirt could be a bit tighter. I may actually put some elastic across the back after I run it through the wash once to see whether the fabric shrinks a bit. To add the elastic, I will just open up two spots along the waistband at the back and then run some 1 inch elastic through and tack it down. That should do the trick. Thank you, Shannon, for all that you do for the sewing community. 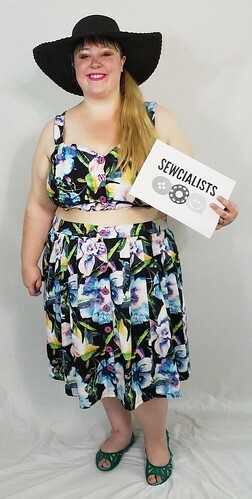 You are an amazing Sew Style Hero! Print envy here, how lucky to find that in stash. 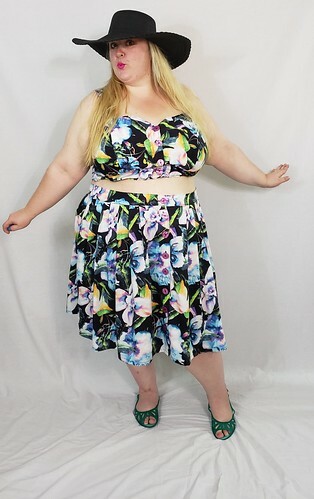 I love that you are giving credit to your sewing inspiration, and your take on the crop top and skirt is fabulous! I too love the look! 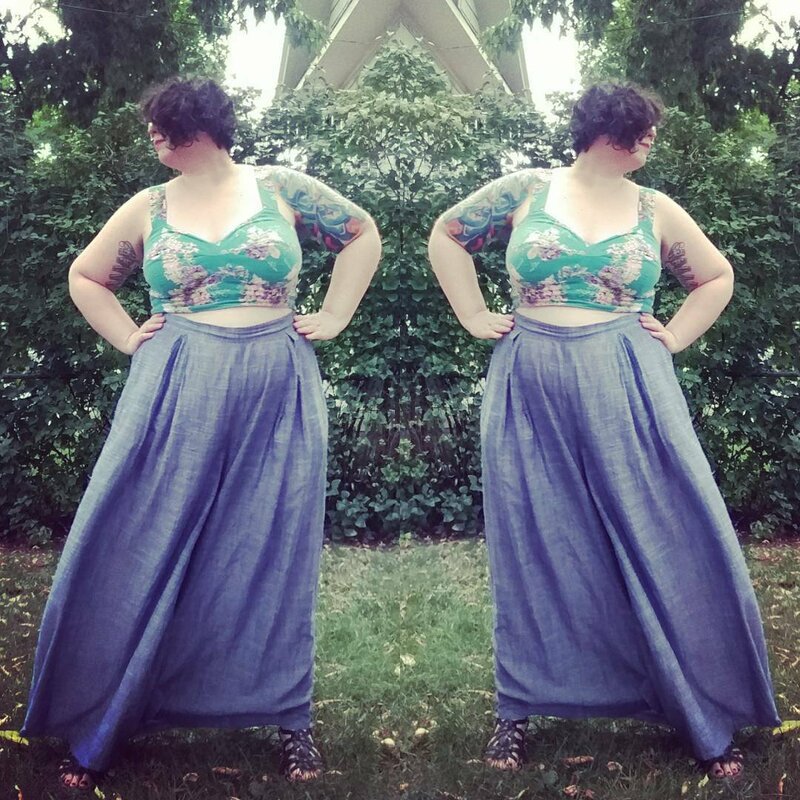 I don’t remember if I already commented on this on the Sewcialists blog, but…That crop top really is SUPER-CUTE.